In the era of professional rugby, Andy Hazell is a Gloucester-born legend, playing 268 1st XV games for his only club over a span of 17 seasons. Weighing only fourteen and a half stone (92kg) in his prime and barely six foot (1.83m) in height he made every pound and inch count, as an old fashioned open side, a terrier in the tackle and a formidable forager on the ground. This, combined with a fair turn of pace made him a feared opponent. Hazell played 7 full internationals for England, also playing for an England XV v the Barbarians and for his country at Under 21 and A level. He toured North America, South Africa and Australia and New Zealand with England. For Gloucester, he played a major role in the 2002-03 premiership season in which the club topped the table by 15 points, played in the 2002-2003 Powergen Cup Final victory over Northampton at Twickenham and scored a try in the 2005-06 European Challenge Cup victory over London Irish at The Stoop. He played 29 games for Gloucester in the Heineken Cup from 2000-2012, playing in each of their first nine seasons in the competition. Andy Hazell was born in Gloucester on 25 April 1978 and educated at Severn Vale School. His first representative rugby was as a schoolboy, playing for South West Under-16s. He played for Old Richians and Gloucester Old Boys as a junior before joining Gloucester in 1997. Although he had played Colts Rugby for Gloucester he had to struggle to gain his first professional contract, which perhaps caused him to value the Gloucester shirt all the more. 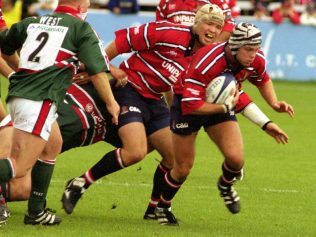 Hazell only played once for the 1st XV in his first season at the club, making his debut coming off the bench against Newcastle in a Premiership game at Kingsholm on 14 December 1997. Competition at openside was fierce and for the next two seasons his starts were limited as he understudied first Nathan Carter and then club captain Kingsley Jones, although he frequently made an impact when coming off the bench. His potential was recognised however and he gained selection for England Under-21, taking part in the SANZAR/UAR World Under 21 tournament in Buenos Aires in summer 1999. 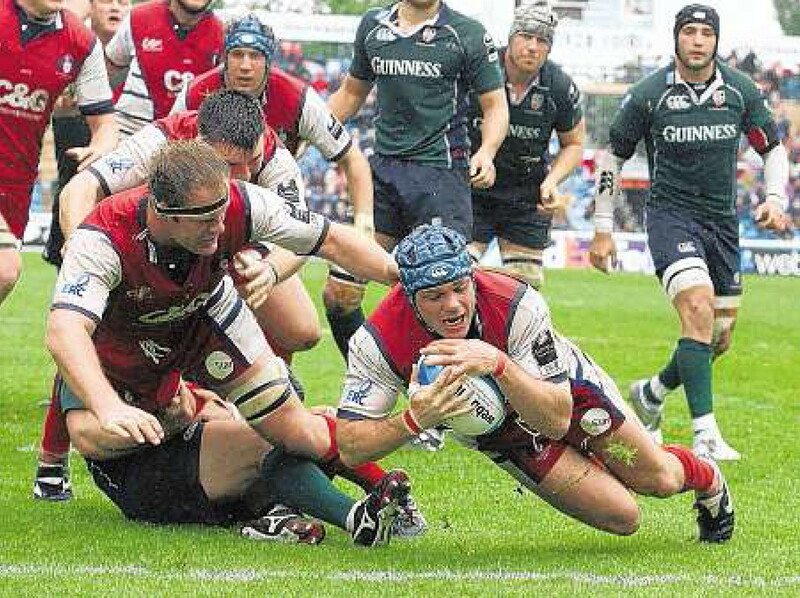 Although 2000-01 was a disappointing season for Gloucester in the Premiership, the club reached the semi-finals of the Heineken Cup for the first and only time, losing 19-15 to Leicester at Vicarage Road. Hazell played a part in all eight matches, starting in two, and challenged Gloucester captain Kingsley Jones for the number 7 shirt. He was selected to play for an England XV against the Barbarians at Twickenham at the end of May. England lost 43-29 against a strong Barbarians line-up but The Times said “Neither Alex Sanderson nor Andrew Hazell gave an inch, forcing the turnovers that England needed to give their speedy backs space.” He went on to tour North America with the full England side that summer, playing in both midweek games. He scored a try against British Columbia, but missed out on a test place. Returning home, he made his England A debut against Scotland A at Headingley. 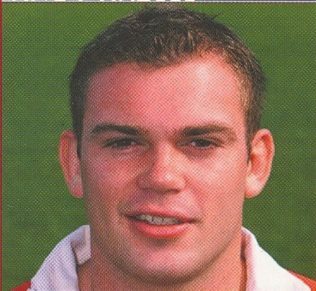 However 2001-02 was a frustrating start-stop season for Hazell in which toe and hamstring injuries impeded his progress and it was not until the following year that he hit the heights with Gloucester. 2002-03 was the club’s greatest season of the professional era. Andy Hazell was a key member of a Gloucester side in which the back row of Hazell, Jake Boer, and Junior Paramore were outstanding. Gloucester topped the Premiership table by 15 points and won The Powergen Cup. He played in the Premiership Final defeat by Wasps and in the hard fought Cup Semi-final victory over English and European Champions Leicester at Kingsholm which led to a magnificent Cup Final victory over Northampton, who were beaten 43-22 after leading 22-20 at the break. He played for England A throughout the 2002-03 6 nations A tournament and then, as a member of the 43-man squad from whom the World Cup party would eventually be chosen, toured Australia and New Zealand with the senior England side. After playing in England’s 23-9 victory over New Zealand Maori in New Plymouth in June, he was one of six (including James Simpson-Daniel and Tom Palmer) who were called to Vancouver to strengthen the England A side who were going on to tour Japan as Churchill Cup Winners. He played in both matches against Japan. Andy Hazell played for England A in the home internationals again in 2003-04 and at the end of the season played a second time for an England XV against the Barbarians at Twickenham. Once more The Times correspondent, looking at a 31-12 defeat from an England viewpoint, wrote “The form of the flankers was the brightest feature of the game”. In the summer he toured North America with England A and played again in the Churchill Cup. After four years in the frame the full England cap still eluded him. He finally broke through to make his England debut against Canada at Twickenham in November 2004 and came on as a replacement against South Africa a week later. He went on to play four games in the 2005 Six Nations tournament, starting against Wales and scoring a try as a replacement against Italy. Two more fine seasons followed with Gloucester. In 2005-06, he capped his season by scoring a try in the memorable extra time European Challenge Cup victory over London Irish at The Stoop. In 2006-07 he was Gloucester’s Player of the Season and was outstanding in his club’s 50-9 Premiership Semi-Final victory over Saracens at Kingsholm, scoring one try and providing the scoring pass for Luke Narraway. He started 17 of his club’s 22 Premiership games in each season. This led to selection for the 2007 summer tour of South Africa. He started the first test at Bloemfontein, but it was to be the last international cap for both Hazell and team mate James Simpson-Daniel. In 2007-08, the image of Hazell as a “small”, mobile, ball-winning specialist open side started to tell against him and his opportunities became more limited, when competing with players who were perceived as able to play in any of the back row positions. This was compounded in 2008-09 as knee problems dogged his season at a time when ironically Akapusi Qera was also out of the side while recovering from a cruciate ligament operation. The number 7 shirt was passed to Apo Satala and Alasdair Strokosch. After a testimonial year which included a match between Gloucester and Bath XVs at Kingsholm with Hazell and British Lion Lee Mears as joint beneficiaries, one final stand-out season remained when in 2010-11 he started in 14 Premiership games and played throughout the successful LV Cup run, culminating in the 34-7 victory against Newcastle Falcons in the Final at Franklyns Gardens. Hazell attributed this to the change in the refereeing of the breakdown, which allowed the game to become more open and encouraged his style of play. Now aged 33 but once more the motivator and driving force in the Gloucester side, Andy Hazell suffered a series of setbacks in his final seasons with Gloucester. In September 2011, he broke his thumb playing against Northampton, keeping him out initially until December, but further problems put his return back to February and he had to fight to regain his place. Back in the side in October 2012 he was red-carded for retaliation (for the only time in his career) while playing at Mont de Marsan in the European Challenge Cup and was banned for 14 weeks.